They say, "necessity is the mother of invention". In my house this is literally true. More often than not when someone needs something or something needs to be repaired, I find a way to create, fix, or rig up the item instead of buying new. I really enjoy being industrious. It's a fun challenge and is a satisfying way to be frugal. I would always rather make something we need with materials on hand instead of searching, shopping or waiting for an item. And nothing is more fun to make yourself than costumes! This leads us to "Spirit Week". Schools have these a couple times per year and they are super fun. Kids have themed school days for which they are encouraged to dress up. I love helping my daughter put together fun Wacky Wednesday or Nerd Day outfits. Recently, one of our Spirit Week days was 80's day! 80's fashion was so fun and flashy, it remains a staple costume theme and I don't think it's going anywhere any time soon. My daughter's 80's costume was based on the popular athletic style trends. We found an off the shoulder cropped sweater, and layered it with a studded tank top. Then we added leggings, and of course- leg warmers! 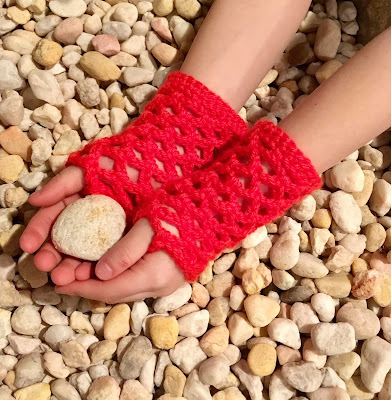 I made my legwarmers (pictured below) a long time ago when I was first learning how to crochet, and there's no pattern for them, unfortunately. If you need a legwarmer pattern, visit allfreecrochet.com and search their amazing database of free crochet patterns to find the perfect legwarmers for your 80's costume or to complement your winter wardrobe! We also did a side ponytail and added her big cheerleading bow for fun. Her football team's colors are orange and black so with all that pink, we needed to add one more accessory in orange to complete the look. I knew I wanted to make her some fishnet gloves. What could be more 80's? The night before 80's day, I figured I'd skim the interwebs for free crochet patterns to see what I could find and whip up for her. I did find a couple on Ravelry, and they looked OK, but I wasn't completely satisfied and they didn't come in children's sizes. So I played around and came up with my own easy pattern for fishnet gloves. Really, our family motto should be, "If you can't find what you want, make it yourself!" So, thanks to 80's day, here's another fun pattern for the crochet world! The 80's fishnet costume gloves are worked using a very simple method, mostly chaining, and can be easily resized for a custom fit for any person, any age, any size hand! The netting is worked using a base row with a multiple of three. No complicated thumb holes, simply use any opening in the netting. They can be worn long up the arm, or low on the hands. Add or delete rounds for a custom length. Try in a cool neon variegated yarn for a very 80's look! 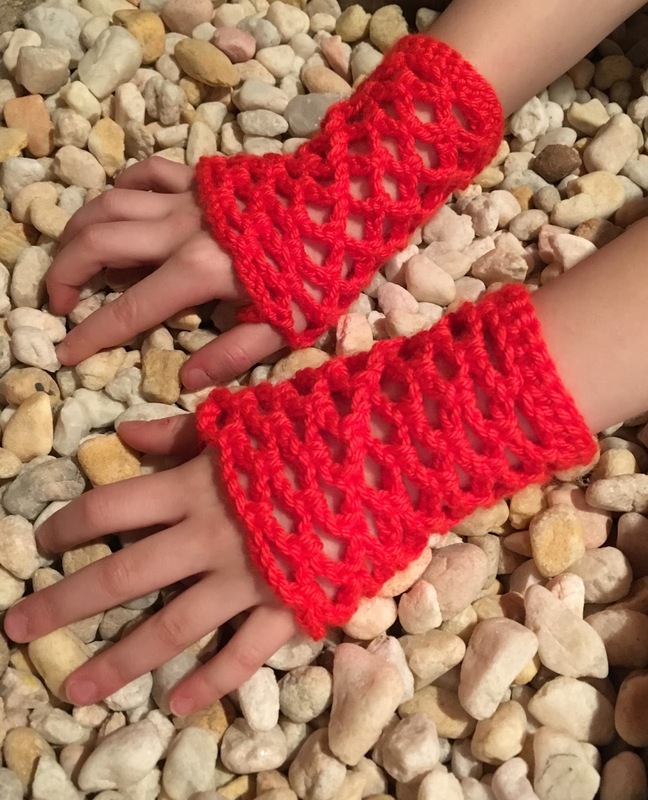 To make these gloves for an adult simply measure the hand/wrist, check the pattern gauge and work accordingly in a corresponding multiple of three. The pattern as written fits a child's hand 6-8 years. Fhdc- Foundation Half double crochet: ch 2, yo, insert hook into 2nd ch from hook, yo draw up a loop, yo draw thru first loop on hook (same as making a ch 1), yo draw thru all loops (first fhdc made). To continue fhdc: *yo, insert hook thru “v” on top of last st made, yo draw up a loop, yo draw thru first loop on hook, yo draw thru all loops*. Repeat ** to desired # of sts. Note that beginning chain and foundation row will be made simultaneously with this method, and the work will fall vertically from your hook as it is formed. The V’s closest to and facing your hook hand will be the top of the stitches that you work into for the next round, the v’s on the opposite side, are the bottom of your work when held horizontally. If you need further assistance with this stitch, please search for and watch tutorial videos on YouTube. If you just aren't feeling it and don't want to fhdc, simply make a foundation ch in appropriate number of chs, join, and then hdc into each ch, join, and then continue pattern at round 2. Easy peasy. To resize pattern for larger or smaller hand: see gauge, measure hand/wrist, round number of sts needed up or down to make a multiple of 3, work accordingly. Round 1: Fhdc 27, join with a sl st. Use the starting tail to join the bottom edge of the foundation round. Round 2: *ch 4, sk 3 sts, sc in next st*, repeat ** around to last 3 sts, ch 2, dc in first ch made (at join from prev. round). Round 3: *ch 4, sc in next ch sp*, repeat ** around to last ch sp, ch 2, dc in top of dc from prev. Round. Rounds 4-12: Repeat Round 3 or to desired length, fo, weave in ends. Use any hole in netting for thumb hole. Share your work on Instagram #hautekippy or post a picture on my Facebook page! Find me on Ravelry, Pinterest or AFC! Select ready made items from my design cache along with printer friendly, ad free PDF downloads of my most popular crochet patterns are available in my Etsy shop!